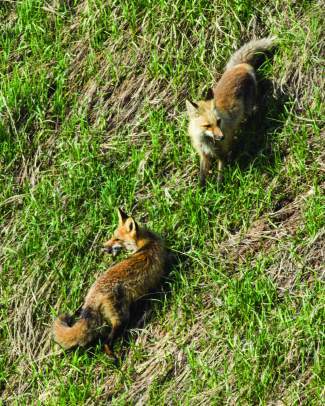 AVON — There are a lot of foxes in Eagle County and Wildridge alone may have five dens. There are four distinct species in Colorado and the most common in the county is the red fox (Vulpes vulpes). The red fox has a white tipped tail and lives in woodlands and mountainous areas. It is the largest of the foxes. The gray fox has a black-tipped tail and is more common in brush in the foothills. There is a small fox called the swift fox that is on the eastern plains and a kit fox that is found in shrub lands on the western slope. The red fox is usually reddish orange with black ears and legs. A number of color phases are also found in foxes. They may have a distinct pattern of black and brown on the shoulders and that is called a cross fox. A silver and black phase is also seen. I have seen a black phase fox in West Vail a couple of times. The red fox has a greater spread geographically than any other fox. The are found over the entire Northern Hemisphere up to the Arctic Circle. They also range down to North Africa, Central America, and Asia. They have adjusted well to humans and often are found in towns and cities. Foxes eat birds, rodents, and rabbits. Occasionally snakes and even insects are part of the diet. Ground nesting birds are at risk and so are their eggs for being a fox’s lunch. Foxes mate in January or February and will have a single litter each year in April or May. The female, called a vixen, commonly have four to six kits, though 12 have been observed. The den is usually a hole dug into a hillside, many times around rocks. The den in these photos has been occupied and produced kits for at least eight years. Many people who watch a fox will comment how cat-like they appear and behave. When they bed down they will circle like a cat and often cover their nose with their tail. They are most active from dusk to dawn and tend to lounge around during daylight hours. Rick Spitzer is the author of Colorado Mountain Passes, published by Westcliffe Publishers and available at the Bookworm, City Market, Amazon, and many stores across the state. The book provides photos and text about the history, lore, wildlife, and scenery around the passes of Colorado.